Florida Governor Rick Scott’s name is being bandied around as a possible vice presidential pick for your future president/sea sponge overlord Donald Trump. 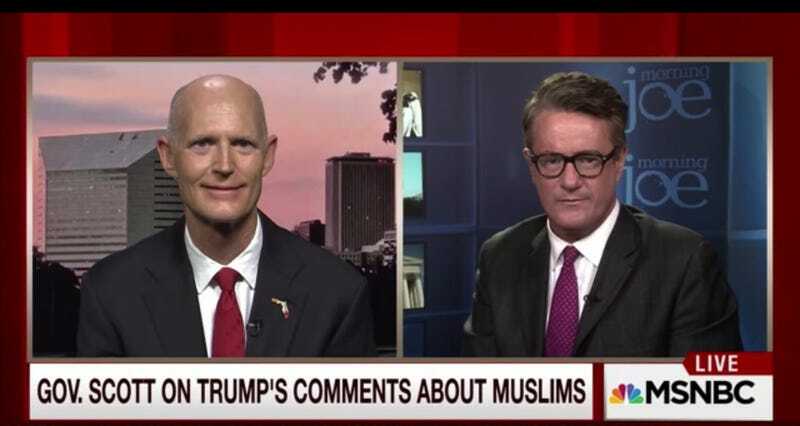 That’s possibly why Scott refused to say on MSNBC Thursday morning how he feels about Trump’s comments about Muslims. Florida: continuing to gift us only its best and brightest! “Well,” Scott began. “As you know, in Florida we’re the best melting pot in the world. We love everybody coming to our state.” He added some garbage about the federal government not “vetting” Syrian refugees, before Scarborough redirected. And redirected. And redirected. Scott giggled nervously, gave another non-answer, and the hosts cut to commercial.